DM Church is now playable, as Satanic Church! You spawn with a gun (in arcade and classic rounds) and there are more weapons scattered around the map. This is also the first released map in the "Spooky" theme. I am also working on a Bedroom map, using demian's bedroom as a base. The bedroom itself and the basement have been isolated, with the house "shell" removed, and teledoors will be placed to get you to the secret areas. Also it's proving much more difficult than the above but I am working on porting the chaos canyon from roblox to this gamemode. Pinball launcher is much more OP than pong gun. Even seeing it makes me fear for my life. - Normal chat no longer shows up to only people inside of the minigame. This is for if someone inside the minigame wanted to speak to an admin who has left it. I may be uploading the musicless version of Deathmatch to glass, in addition to around only 3 maps, due to limitations and annoyances Glass provides to me. EDIT: I've uploaded the gamemode and two maps, I stopped uploading more maps because the upload interface refused The Heights saying it was missing required files. Very nice. - Edited chat now compatable with Server_ChatEmotes. Load server_chatemotes with the /setaddon commands and it'll work. - Some achievement descriptions should be fixed if they weren't working before. Punctuation was accidentally left in achievement names for getting their descriptions. - Homing rockets should push players less now. - Homing rockets are now slower. - The v20 category in official maps has been replaced with "Old" due to maps from versions before Blockland v20 being sorted in it. Redownload the v20 pack and the satanic church. - Blank descriptions and credits are now detected, this allows descriptionless maps to be put onto Blockland Glass. It's frustrating that I have to do this in the first place. - Speedkarts from the default Speedkart gamemode are now loaded. Here's 2 new (from preexisting builds?) 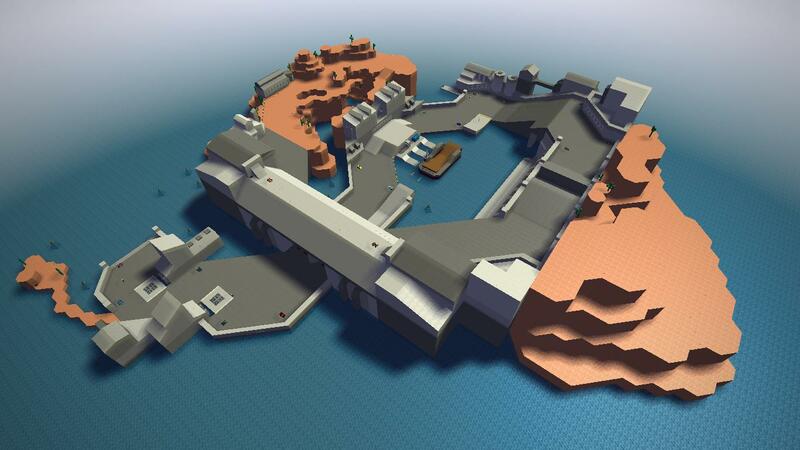 DeathMatch maps: Hydro Plant and Harbor! Each player can now duke it out on the familiar SpeedKart map while also racing... for no purpose. Their lives may still be in stake just as in SpeedKart, it seems. Here's a music loop that goes well with the track! Cause mass hysteria in the... barely populated urban portion of the iconic SpeedKart track. Try to get the SpeedKart before anyone else does! - Fixed 4 team round only appearing if team rounds are being forced. - Servers with 2 players wont be put in the same team anymore. - The homing rocket should no longer target teammates. - Fixed issues related to bots not loading. - Removed welcome message from gamemode.txt. - Fixed player camera screwing up if a teammate runs another teammate over. - Fixed rocking vote status not resetting at round end. - Made links possible to post into chat by parenting to default chat if a link is detected. - Fixed console errors related to Grapple Rope and Puller Rope. - Fixed console errors related to the baseball bat. - A message appears if a team member tries to attack their teammate. - Added alternatives to the debug commands that echo to the console instead. - Added echos to more places to assist dedicated server hosts. - Bots should no longer unlock achievements. - Rounds now only start and end if there are people in the minigame. The rounds doing nothing might also allow admins to make maps without having to disable map rotation. (as they would leave the minigame) I haven't tested if this is a viable method yet. - Kill water death message now shows the ui graphic for fall damage. Helps to differentiate it from suicides. Also fits better. - Flamethrower death message now has an additional fire graphic from Blockheads Ruin Xmas. - Bottom print map loading message from FASTKarts has been added. - Rounds are now shown in the bottom print. - The player type now shows up in the bottom print for arcade and classic rounds if the round picker is turned ON. - Added a few more tips. - Added another death sound. I might add more round types making use of the separate team round type variable I added in an earlier version. Uploaded v19 to my site, will upload to nexus and glass soon. - Renamed a few songs. Roblox maps and the Dead Simple map have been edited to reflect the name changes. Redownload them. - Attempted to reduce character usage in bottom print. Less of it should be cut off. - The bottom print continues to show you your playertype when you're dead instead of just simply saying "Dead." - Fixed voting for a super high map number resulting in a blank map name which loads the first map. ._. - Attempted to fix the achievements that were broken. - Fixed same teams colors being picked for different teams. - You are now forced to respawn after dying. - Fixed disabling random team colors not working. - Self kills (suicides) now result in losing 25 points. - Added armor feature. Takes damage for you. Shows up in the bottom print as extra health that can go beyond your maximum health. - Added "kit" items, based on the Spy Kit. - Added events for map makers to use. Player > fall - Kills the player with the fall damage type. Player > addArmor - Adds armor to the player. Player > setArmor - Sets the player's armor to an exact number. Player > setCanCloak - Sets if the player can cloak. - These events can no longer be used in maps. Client > bottomPrint - The hud cancels this out and makes it useless. MiniGame > bottomPrintAll - The hud cancels this out and makes it useless. MiniGame > reset - Maps shouldn't be ending the round early. - Removed grapple/puller rope anywhere prefs - they will grapple anywhere regardless of the pref, and there shouldn't have been any $Pref::Server:: prefs anyway. - Round changing admin commands now put everyone's cameras into observer mode. - Falling into kill water now uses the default fall damage type. - getPlayerName() is now used in places where player names are needed. - Added more debug commands. - Blockhead rays/kit now restore player scale to 1 1 1 in addition to changing the player back to a normal blockhead. - The round picker is now forced to pick something other than the melee random round if that was the previous round. - The airhammer's sound has been readded. - The airhammer's size changes are now more flexible - large players or any other sized players can now be squished without being reverted back to standard width. - Bottom print playertype display can now show stacked effects. - Misc code cleanups and fixes. Redownload the gamemode, the roblox and doom maps, and the music. I plan to add RTB prefs to the gamemode, and overhaul the existing prefs to use less strings. Unfortunately this will up the "pref format," requring DM prefs to be reset if updating from an earlier version. The pref changing commands will still remain for people who do not want to use RTB or Glass/Support_Preferences. This is taking some time as I have to comb through all the code to make sure all the new prefs replace the old ones. Feel free to suggest/request/criticise stuff in the meantime. Also, the Sumo Map pack is no longer supported due to issues with relying on players having the least negative points to win, without any way to earn points. They will also no longer be in the "Deathmatch all maps" pack. - Added a bit more info to the initial /help command. - Added and changed some tips. - A star now appears next to winners' names in chat instead of the word "winner." - Quake-Like Player can now be picked in random loadouts. - Overhauled chat related stuff to be cleaner. - "Emulated" flood protection has been changed a bit. Any message attempt during a flood protection countdown should no longer be "recorded" by the flood protection. Chatting faster than 1 second will now trigger flood protection. Flood protection can now be disabled. The "Do not repeat yourself" and "Slow down" messages will still show up. These changes may not be true to default flood protection but again, I feel they are good changes. - Lowered requirements for successful map votes. - Pushbroom sumo and jeep sumo maps will no longer be supported due to issues with relying on players having the least negative points to win, without any way to earn points. They will no longer be in the "Deathmatch all maps" pack. - Health will no longer show up as being 0 while the player is still alive. This was happening because the decimals were hidden, so players actually had health that was below 1, but still not 0. This can happen with explosions, the flamethrower, or anything that doesn't have a specific damage value. This was simply fixed by using mceil instead of mfloor - now any decimal point will always round the visible health up one whole value. - /dTeamList has been moved to /teamList and is no longer a debug command. It is still listed in the /dmDebug list, and /maplist is now listed in there as well. - /dmDebug command now also shows the console command versions of the debug commands. - Typing DM_Debug(); into the console lists all console debug commands. - Prefs have been overhauled. This will require your prefs to be reset. Prefs can now be changed with RTB or Glass/Support_Preferences. Individual round types can now be enabled/disabled at will. If every single one is disabled, the arcade round type is forcefully enabled. You can now choose specifically how often a team's color will be randomly changed. Crouch jump height pref and crouch jump bypass height max pref can no longer be edited and are hardcoded. You can now load up to 10 addons instead of 5. Unlimited spy kit pref can no longer be edited and is hardcoded. Colorful old school weapons can now be set with a command. Parts of PGDie can now be disabled/enabled at will. There are now pref presets that have different pref setups. - Tips no longer print to console. - If there is less than two people in the server, a "tip" appears in chat letting the player know the game is best played with multiple people. - Misc cleanups and fixes. A lot of internal pref changes and cleanups went on here, so if you discover something that seems very off please tell me. Also, ticking one of the preset options will not update the preferences gui, so be careful with it. 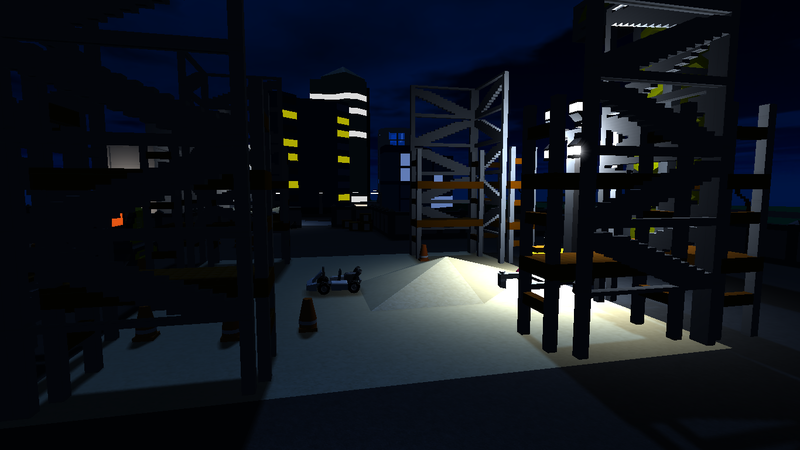 i wanted to make a city skyscraper roof map before but i cancelled it because people were calling the buildings too bland and repetitive. - Attempted to fix Big Boned, Blockland Bug, and Sneak Attack achievements. - Added new Sharp Eyes achievement. - Health kit now adds 100 health. - Grapple Rope and Puller Rope now use RAYCASTS!!! This makes the ropes travel instantly to what you target at, making grapple gameplay so much easier. - Added Assist Kills by Space Guy. - Added Killstreaks and Dominations by Swollow. - Added achievements that make use of killstreaks and dominations. - Fixed setting round limit to -1 (infinite rounds per map) showing the loading map message. - Added new Bedroom map. It's in the v20 pack, and has been added to the all maps pack. - Fixed spy kit setting players' shape name distance too low upon uncloaking. - Fixed instances of round types being repeated unintentionally. - Chat messages are now trimmed, and a check is in place to make sure players dont send blank messages. - Fixed teams with same colors again. - Team rounds will now only be picked if there are more than 2 players. - 4 team rounds will now only be picked if there are more than 4 players. - Bouncy Player is now in the "cheap playertypes" selection. - An orange Bouncy Kit has been added, which will let players change themselves into bouncy players. - Bouncy Rays and Shotguns have been added, allowing you to suprise players by suddenly making them bouncy! - /stats now correctly shows all stats. - The Roblox Crossroads map has been edited to improve the ladders in the map and to improve brickcount. - Misc fixes and cleanup. The bedroom has been removed from the poll (as it's released) and the poll has been reset. I will still continue working on those maps. I will begin making parts of the gamemode into standalone add-ons in the upcoming weeks/months. Watch for those.